A Social Security Number (SSN) is a permanent nine-digit identification number administered by the Social Security Administration, an agency of the U.S. federal government. SSNs are required for anyone employed in the U.S. because it tracks income for employers and the IRS, but is not required for anything else. Who is eligible to receive a Social Security Number? F-1 students who are employed are eligible for a Social Security Number. F-2s are not eligible for a Social Security Number. J visa holders are eligible for a Social Security Number whether employed or not. If a J visa holder is not employed, OIE would encourage you to think carefully about whether you would like to apply for an SSN because of some dangers of having one (see below). Who is required to have a Social Security Number? All individuals working in the U.S. are required to have a Social Security Number. Many jobs do not require you to have a Social Security Number to begin working, but you should submit SSN information to your employer as soon as possible. Why is everyone asking for my Social Security Number? International visitors are not required to have a Social Security Number to enter the U.S., open a bank account, sign a lease, or get a Georgia driver's license. However, it is likely that you will be asked for an SSN when trying to do these things. This is because SSNs are used to check your financial credit history (i.e. do you pay bills on time?). If you are asked for an SSN by a cell phone carrier, bank, landlord, etc. you should explain that you are not eligible for one. Since you do not have a financial credit history, you may be asked to pay a higher deposit for certain services. I am employed and/or eligible for a Social Security Number. How do I get one? International visitors who are eligible for a Social Security Number can apply 10 working days after your SEVIS record has been registered by ISSS. Your record will be registered after you complete check-in with OIE. If you arrived recently and are not sure if your SEVIS record has been registered, please email info@oie.gatech.edu to confirm. Note: If working at Georgia Tech, you may begin working and get paid without a Social Security Number. However, you should apply for an SSN as soon as possible and report information to Global HR after you receive it. For a list of required documentation and information of the closest Social Security Office, please see OIE's Social Security Handout. To request a Social Security support letter from OIE, please log into iStart and submit the e-form request found under SSN and Taxes. You will be required to upload your job offer letter into the e-form. A support letter will be generated for you within five business days and you'll receive an email that it's ready to be picked up at OIE's front desk. If you get a Social Security Number, you should protect it in order to avoid becoming a victim of identity theft. While you likely will be asked for your SSN when leasing an apartment, setting up a bill or service (cell phone, utilities), or opening a bank account, you should protect your Social Security Number and do not give it out freely. You should not carry your Social Security card around with you. You should keep your card (and your number) in a safe place and do not give it out to anyone who does not have a legitimate reason to ask for it. If someone is able to get your Social Security Number, they can open bank accounts or buy things under your name! You can quickly become a victim of identity theft if someone gets your number and they can cause problems far into the future. Do not give your number over the phone or via email, particularly if you did not initiate contact. If someone is asking you for your Social Security Number and you do not know if you should give it to them, please feel free to email info@oie.gatech.edu and an international student advisor will help to advise on what you should do. The primary purpose of an individual in the U.S. on F-1 status is to study. Students should consider employment as a benefit of F-1 status and and not as a right. Employment without authorization is a grave offense of the F status and affects a student's ability to remain in or return to the United States. Before accepting any type of employment opportunities, please be certain than F regulations allow the employment by reviewing the information provided by OIE. You may send any questions to an international student advisors after reviewing this information by emailing info@oie.gatech.edu or by seeing an advisor during walk-in hours. You must be in valid F-1 status and in good academic standing at Georgia Institute of Technology pursuing a full course of study (except during the summer semester and school holidays). A student who is out of status is not eligible for any F-1 benefits, including employment. Once employment is authorized, you must maintain your student visa status or you will lose the benefit to continue employment. In addition to these general eligibility standards, please review the website for each type of employment for additional eligibility requirements. Students enrolled in classes full-time are allowed to work up to 20 hours per week during fall and spring semester. On-campus employment means that you are paid by Georgia Tech or working at a Georgia Tech location with an employer that is contracted to provide services to students, such as a food store in the Student Center. On-campus employment is a benefit of the F-1 visa status upon reporting to Georgia Institute of Technology and completing the OIE check-in process. 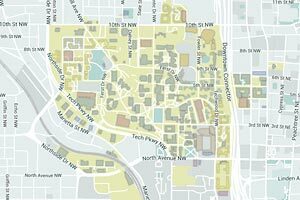 On-campus work is subject to GT policies. Semester breaks, Official school/Summer Vacation: Full-time on-campus employment is allowed during this time. Full-time work is considered to be 20+ hours/week. (Exception: if a student is required to register for the summer, such as a GRA/GTA, then only 20 hours per week maximum is permitted). This full-time eligibility is subject to GT policy. On-campus employment is not permitted after program completion unless the student has applied for off-campus work authorization. See an International Student Advisor for details. A great way to search for employment on campus is to utilize the Student Center employment resources. Please see their website on working at GT, including the Student Center Jobs Board and the Campus Jobs Board. Many international students also find success is work as a tutor for Student Athlete Services. In general, F students must be enrolled full-time (12 credit hours) for two fall or spring semesters before becoming eligible for off-campus employment. This means that if a student begins their academic program in a fall semester, they will be eligible for off-campus work after attending full-time fall and spring semesters. If a student begins in the spring semester, they must attend full-time spring semester and the next fall semester before becoming eligible for off-campus work. Any student who will work in the U.S. must apply for a Social Security Number, as the employer will need the SSN to report wages and taxes to the Internal Revenue Service (IRS) and Social Security Administration (SSA). F students are eligible to apply for an SSN after they have received an offer of employment that meets SSA standards. For more information on Social Security Numbers, please see our website and our Social Security Number handout. Students who will work on-campus should request a SSN Letter of Support from OIE. To request a letter of support, please log into iStart and complete the SSN Letter Request for F-1 Students found under SSN and Taxes. Students who have approved off-campus authorization may use the third page of their I-20 listing the employment authorization in order to apply for an SSN. Curricular Practical Training (CPT) is authorized off-campus employment and is an integral part of the degree program. At Georgia Tech, an F-1 student may be eligible for CPT based on a required internship class for academic credit toward degree completion or participation in the co-op or internship program through the Center for Career Discovery and Development (C2D2). F-1 students authorized for CPT must register for credit through C2D2 or register for the internship required by their academic program. Students must be in good academic standing to be eligible for CPT. Any employment during the F-1 program must be an integral part of the student's educational program. F-1 students must be enrolled full-time (12 credit hours) for a fall and spring semester before becoming eligible for CPT. An F-1 student who begins their academic program in a fall semester can be eligible for off-campus work after attending full-time fall and spring semesters. An F-1 student who begins in the spring semester must attend full-time spring semester and the following fall semester before becoming eligible for CPT. F-1 students may be authorized for full-time CPT or part-time CPT. CPT can be authorized as full-time (20 hours or more) for F-1 students participating in the co-op program or internship program or who have a required academic internship in the summer semester. Students enrolled in their final semester may only be authorized for part-time CPT. Graduate students enrolled in a thesis program may pursue a full-time position in the final semester if approved for Post-Completion OPT. F-1 students authorized to work more than 12 months of full-time CPT, are no longer eligible for OPT. Part time CPT has no impact on eligibility for OPT. CPT can be authorized when a Georgia Tech student participates in the co-op or internship program through the Center for Career Discovery and Development. More information about the co-op and internship programs can be found on the Center for Career Discovery and Development website. Undergraduate students majoring in Building Construction who enroll in the internship for academic credit must work with their academic advisor to submit a request for CPT. Graduate students majoring in City and Regional Planning or Informational Design and Technology who enroll in the internship for academic credit must work with their graduate coordinator to submit a request for CPT. F-1 students are required to enroll in at least 12 credit hours during their first semester of enrollment at Georgia Tech and each subsequent fall and spring semester. To meet the 12 hour minimum requirement, students must enroll in 12 hours of academic class, alternating work-study semesters which include 12 hours of co-op credit, or 6 hours of internship credit with the remaining 6 hours of academic class credit which count toward academic degree completion. The permit to enroll in the internship or co-op course will be given by the career advisor in C2D2 once the CPT has been authorized by the OIE. CPT authorization can begin prior to the start of the term but will not usually go beyond the term end date. Term dates are availalbe on the GT Academic Calendar. Students who want CPT to go beyond the end date of the term can start an appeal process with C2D2. Register for at least 12 credits of courses and only drop classes once registered in the internship or co-op course. All CPT requests must be submitted via iStart by C2D2 no later than the Friday before classes begin. Students not enrolled in a minimum of 12 credits by the end of phase 2 registration, are in violation of their F-1 status which can result in the termination of their SEVIS records. Students who lose their employment need to consult with C2D2 right away. If the employment termination is determined to be for cause then the student is removed from the credits and therefor out of status. Employment must not exceed 20 hours a week while school is in session (inclusive of both on-campus and off-campus employment). It is VERY important that students registering for a 6 credit internship course, work no more than a cumulative of 20 hours per week to ensure compliance with F-1 regulations. F-1 students may work full-time when school is not in session during the annual vacation. CPT requests for students who are employed on campus will be carefully reviewed. Students with a GRA/GTA cannot participate in CPT or OPT in the same term as the assistantship. Once the job opportunity is approved by the Center for Career Discovery and Development (C2D2), the career advisor will submit a CPT request e-form on your behalf through iStart. Students are required to complete the second part of the e-form, indicating they understand their CPT responosiblities. OIE requires all CPT requests to be initiated by C2D2 no later than the Friday before classes begin, of the term being requested. After a request is submitted by C2D2 and the student the CPT authorization may take up to five business days for an international student advisor to approve. You will receive a new I-20 with the CPT authorization, which includes the employer's name, address and the specific dates of employment. You can only work during the dates of employment authorized on the I-20. The I-20 with the CPT authorization is proof of employment eligibility, which you must show to your new employer to complete Human Resources processing and the I-9 verification required for all new employment. You must register either for the Center for Career Discovery and Development course or with the internship required for your academic program. The Office of International Education will collect a $35 fee each time an international student holding an F or J student visa receives practical training benefits in the form of Curricular Practical Training (CPT), Optional Practical Training (OPT) or Academic Training (AT). Student e-forms submitted to the OIE for review after June 15, 2017 will be required to show evidence of PTF payment. Specific instructions for paying the fee will be include in the respective eform. Optional Practical Training (OPT) gives F-1 students an opportunity for work experience in the U.S. before an/or after completion of a degree. There are three types of OPT: pre-completion OPT, post-completion OPT, and STEM OPT extension. Which type(s) of OPT student are eligible to apply for depend upon the specific situation of the student. Learn more about OPT by watching the new courses . You'll need to log in with your GT information. Click the image to view the OPT course! Currently there are no live webinars available. Check back here for updates. 1. OPT is limited to a total of 12 months for each higher degree level in a job directly related to the student's field of study. 2. In general, F students must be enrolled full-time (12 credit hours) for two fall or spring semesters before becoming eligible for OPT. This means that if a student begins their academic program in a fall semester, they will be eligible for off-campus work after attending full-time fall and spring semesters. If a student begins in the spring semester, they must attend full-time spring semester and the next fall semester before becoming eligible for OPT. 3. OPT does not have to be included as an internship or practicum required to complete a degree. 4. Students are not required to have a job offer to apply for OPT. 5. OPT is recommended by an International Student Advisor in the Office of International Education, and approved by the USCIS. USCIS can take as many as 3 months to process an OPT application. 6. Once approved, the student is issued an Employment Authorization Document (EAD) card with the dates the student is authorized to work marked on the card. To learn what constitutes employment while on OPT, click here. You will use the form I-765, found on the USCIS website. Please follow the instructions found on our Completing the form I-765 website. Important Note: The I-765 form on the USCIS website has recently been changed. While the information has been placed in different locations, the information for the application is the same. Please continue to use OIE's materials as guidance in completing the I-765 and we will update our materials as soon as possible. In addition to the I-765 and I-20, you will be required to submit additional documents with your OPT application. For a complete list of OPT application documents visit the OPT Application Document Check-list website. You are responsible for ensuring that USCIS receives your OPT application documents within 30 days of your OPT recommendation! Please Be Aware: Do not submit an electronic OPT application or e-file your application. These applications can take longer or even be denied by USCIS. Please follow OIE's instructions and submit the paper application. When employed all students on OPT are required to report the following updates to an International Student Advisor using iStart.gatech.edu. Instructions on how to update your OPT employer information is located here. To report your employment or unemployment information, log into iStart and complete the OPT Employment Update e-form found under the OPT tab. Please remember that you can only access this e-form after your OPT start date located on your EAD card. If you cannot log into iStart using your current Georgia Tech ID# or password please follow these instructions please see here. If you continue to have issues please contact us at info@oie.gatech.edu. F-1 Regulations allow students participating in OPT to travel abroad, but there may be additional risks and/or additional documentation to prepare. Visit the OIE's OPT and Traveling Abroad website for more information. Please note that since you will not be a student, you will no longer be enrolled in an insurance plan and should seek personal medical insurance. Please see our Health Insurance after Graduation website for more information. Depart the U.S: If you plan to depart the U.S. and DO NOT plan to return to use your OPT, complete the "Intent to Depart/End I-20 Status" eform in iStart. The OIE will use this information to complete your SEVIS record so that you do not accrue days of unemployment. Please see our OPT FAQ website. 1. What employer information do I need to report during OPT? You should report the following information: employer name, employer address, start date of employment, and any periods of unemployment. 2. How do I report my employer information? You will report your employment information in iStart. You can find Employer Reporting Instructions here. 3. Does my employer have to be in the E-Verify program during my 12-month standard OPT period? No. However, to be eligible for the 24-month STEM extension your employer is required to be an E-Verify employer. For more information on the 24-month STEM OPT extension, please see our website. 4. Do I need to continue to update my personal address while on OPT? Yes; you must continue to report any changes to your physical U.S. and foreign addresses while on OPT. This cannot be a PO Box or your company's address. Complete the Personal Information Update e-form through iStart. 5. Can I be unemployed during OPT? Unemployment is allowable while you are on post-compleiton OPT. However, you may not accrue more than a total of 90 days of unemployment during the initial 12 months of post-completion OPT. 6. What counts as time unemployed? Each day (including weekends) during the period when OPT authorization begins and ends that the student does not have qualifying employment counts as a day of unemployment. OPT authorizaton begins on the employment start date shown on the student's EAD card. 7. How do I report that I am unemployed? You report that you are unemployed in iStart. Type "Unemployed" in the "Name of Employer" field. In the "Date Employment Began" field, use your OPT start date (if you are not employed by the EAD start date) or the date you became unemployed (if you became unemployed during OPT). 8. What type of work is allowed on standard post-completion OPT and which documents should I have to prove employment? Please see ISSS's website on what types of employment are allowable while on OPT and a list of documents that have been suggested by USCIS to prove employment. 9. My employer has asked me to take a business trip outside the US. What do I report? You are not required to change employment information (i.e. the address) if you will take a business trip outside the US. 10. I work in one location, but my employer's office is in another location. What should I report? Report the address of the location where you are working. 11. Will I still have health insurance through Georgia Tech? No, you will no longer be enrolled in an insurance plan and should seek personal medical insurance. Please see our Health Insurance after Graduation website for more information. 12. What is the H-1B cap-gap extension? The H-1B cap-gap extension allows students who have timely-filed H-1Bs to continue working or staying in the U.S. until their H-1B becomes active. Read more at our H-1B Cap-Gap Extension website. F-1 Regulations allow students participating in OPT to travel abroad, but there may be additional risks and/or additional documentation to prepare. OIE is unable to guarantee that students will be granted admission by a Customs and Border Protection (CBP) upon return to the U.S or that the Consulate will renew an F-1 visa at a consulate abroad. Although not common, there are reports of students on OPT having problems at ports of entry as well as being denied visas or experiencing significant visa delays. The decision to travel abroad must be made by the individual student with an understanding of the preparations that should be made and the risks involved. You are currently still an enrolled student so you’ll follow the same procedure for visits abroad and re-entry as enrolled F-1 students. Additional documentation is not required for reentry beyond a valid I-20 signed for travel, unexpired passport and unexpired visa stamp. I-20 containing the OPT recommendation and a travel signature less than 6 months old. Students requiring an updated travel signature should complete the “Travel Signature Request” e-form in iStart to request a new signature. Proof the student is returning to resume employment. This can be in the form of a job offer letter or a letter written on letterhead from the student’s supervisor confirming employment. However, a paystub or other documentation showing intent to return to work may be sufficient for a CBP officer. If a request for more evidence (RFE) is issued by USCIS: An RFE requires immediate attention by the applicant. If the application is approved while the applicant is abroad, the student will be required to present the EAD upon return. Students who decide to travel while the OPT application is pending are highly discouraged from leaving the U.S until the application has been received by USCIS and the I-797 receipt notice has been issued. Students should bring the receipt notice with them as proof that an application has been submitted. Although the receipt notice is a good substitution, admission into the U.S. is up to the discretion of the CBP officer, and there have been reports of students without their EAD work permit having problems at the port of entry. OPT is a benefit of the F-1 status. Therefore, students traveling while on OPT and have an expired F-1 visa are required to apply for a new F-1 visa. Although the U.S. consulates/embassies are permitted to grant visa renewals to students participating in OPT, these students may be subject to additional scrutiny. The F-1 visa is a non-immigrant intent visa. Therefore, applicants are required to provide proof of “binding ties” to their home country. This may be more challenging for some students on OPT. Procedures and requirements for visas can vary between countries and are often subject to change. As such, reviewing the visa requirements on the website for the appropriate U.S. Embassy/Consulate is the best way to prepare you for the visa application process. Visit www.travel.state.gov to determine the procedures for applying for a visa at the U.S. Embassy/Consulate in the country in which you’ll be traveling. For general guidance and information on visa renewals please visit the OIE’s Visa Renewal website. F-1 students participating in OPT traveling to Canada, Mexico, or the Caribbean (except Cuba) for less than 30 days are eligible to reenter the U.S with an expired F-1 visa as long as they qualify for automatic visa revalidation. Citizens of Syria, Sudan, Iran and Cuba do not qualify. For more information visit ICE’s Reentry for F-1 Nonimmigrants Traveling Outside the United States. Students who accrue more than 90 days of unemployment while participating in post-completion OPT will likely be deemed not eligible for reentry into the U.S. by a CBP officer. Students who have/will accrue more than 90 days of unemployment and have decided to leave the U.S. are advised to complete the “Intent to Depart/End I-20 Status” e-form in iStart. An International Student Advisor will review the e-form and complete the SEVIS record which will stop the accrual of unemployment days and end the student’s SEVIS record. Students are advised to leave the U.S as soon as possible after the SEVIS record is ended and will not be eligible to return to the U.S to continue to use their OPT. Traveling as part of his or her employment. Students who have/will apply for a change of status to H1B, permanent resident or any other immigration status should speak with their immigration lawyer prior to making travel plans. Students utilizing the Cap-Gap extension should not travel abroad during the period of time between the end of the EAD and the start of the H1B unless they are eligible to return to the U.S. with the H1B visa stamp. Click here for a comprehensive review and additional guidance related to travel. What are the STEM eligible majors here at Georgia Tech? How do I apply for the 24-month STEM OPT extension? What types of employment are allowed on STEM OPT? The H-1B cap-gap extension allows F-1 students currently on post-completion OPT to continue working if they have a timely-filed H-1B petition requesting change of status and an employment start date of October 1 (the first day of the following fiscal year). An automatic cap-gap extension of an F-1 student's duration of status also applies to the duration of status of the student's dependents in F-2 status. "Cap-gap" has become the common term used to refer to the "gap" in nonimmigrant status that occurs in a change of status to H-1B, when a student's current nonimmigrant status expires before the requested H-1B start date. For example, an F-1 student with an post-completion OPT end date of June 30 will have duration of status for 60 days beyond that, until August 30. The gap between August 30 and October 1 is a "cap-gap." Who qualifies for an H-1B cap-gap extension? 1. Students working on post-completion OPT with an end date on or later than April 1 and have a timely-filed H-1B petition. Students on post-completion OPT may continue to work until 9/30 until the H1B begins on 10/1. 2. Students who are currently in their grace period with a timely-filed H-1B petition. These students may stay in the U.S. until the H-1B begins on 10/1, but are not eligible to work during this time. The student must not have violated the terms or conditions of his or her F-1 status. Is there an application or fee for the cap-gap extension? No. The extension is automatically recorded on your SEVIS record. How do I get an updated I-20 showing the cap-gap extension? You may request a cap-gap extension I-20 from OIE to present to your employer. To request a cap-gap I-20, log into iStart and complete the Cap-Gap I-20 Request e-form. You will be required to upload a copy of a receipt notice from USCIS showing that your application was filed in a timely manner and is being adjudicated. Within five business days, an international student advisor will process your request. Do I have to have a new I-20 showing the cap-gap extension? No. The cap-gap extension is automatic as long as you have timely-filed H-1B petition. However, some employers request evidence of work authorization or you may be applying for benefits (i.e. renewing a drivers license) that may require a reprint.